IF YOU ARE A POOR TRANS WOMAN AND WOULD LIKE TO READ THIS: Contact me at tkwidmer at gmail.com and I give you a promo code to download it for free! ABSTRACT: Minority groups have long faced a lack of representation in the entertainment industry. Too often when representation does exist it relied on stereotype and convention. This too is often the fate of transgender individuals when they are depicted on the screen and stage. The majority of film and television depictions of transgender individuals are inadequate. When they are depicted at all the portrayals rarely rise above trope, archetypes, and conventions. Most often the identity of the transgender individual is invalidated. Very rarely are transgender people’s identities supported. 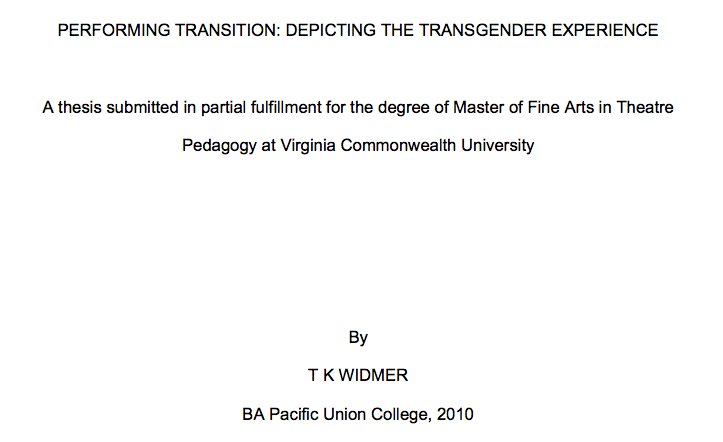 This thesis explores my own personal connection with the topic, builds a vocabulary with which to discuss the subject, examines existing film and television performances of transgender characters, and finally examines how new portrayals might challenge the existing stereotypes. I hope that this thesis, which explores a topic not often discussed, will open the door for a new theatre that supports and affirms the identities of the transgender population while managing not to sensationalize or exploit their stories for the simple entertainment of a cisgender dominated society.